As I have argued before, the absence of hijackings since 9/11 is almost certainly not due to the unenhanced security provided by the Transportation Security Administration, which daily protects our nation’s planes from the threat of oversized nail clippers, undeclared water bottles, and suspicious-looking monkey diapers, while (to my knowledge) retaining its perfect record of not detecting actual bomb parts when its security is tested by other government agencies. The new threat: snow globes. 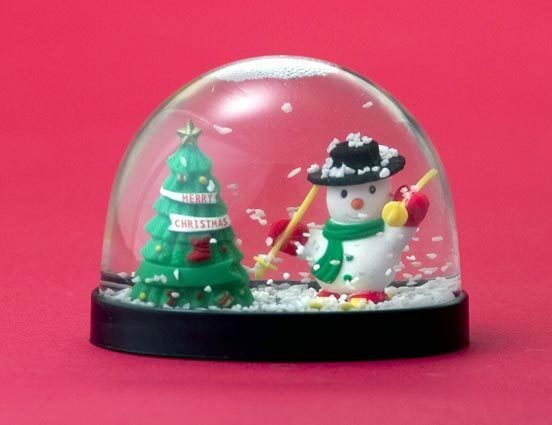 The Seattle Times reported on November 12 that the TSA does not allow snow globes to be carried through airport security checkpoints, according to TSA spokesbot Dwayne Baird. The globes, as you probably know, contain liquid, and each of us now is limited to three ounces of liquid, gel or aerosol per container, and only so many containers as will fit in that plastic bag. Baird said that even a small snow globe would be rejected, though, because they do contain liquid and security screeners “can’t really determine how many ounces are in there.” So out of an abundance of caution, no globes would be permitted at all. As dozens of commenters at boing boing immediately pointed out using high-school math, it is easily possible at least for non-TSA employees to determine a snow-globe size limit that would ensure any particular globe could not contain more than three ounces of liquid. That limit turns out to be a diameter of about 2.5 inches, which would still allow at least small globes to be carried on, and which as one commenter pointed out, the TSA could presumably deal with by cutting a 2.5-inch hole in a board. If it goes through the hole, it goes on the plane. If not—well, if not they would probably call in the bomb squad and detonate it in place so as not to take any chances. Merry Christmas. Of course, the concern over how much liquid is in a snow globe does sort of beg the question of WHY THEY ARE NOT FOCUSED ON DETECTING ACTUAL BOMB PARTS MORE THAN ZERO PERCENT OF THE TIME. The Times reminded travelers that the snow-globe dilemma could be resolved in two ways: (1) pack your globes in checked baggage, or (2) leave your globes at home and instead buy a souvenir globe at an airport shop after clearing security. So look for a host of airport snow-globe kiosks to spring up this holiday season.